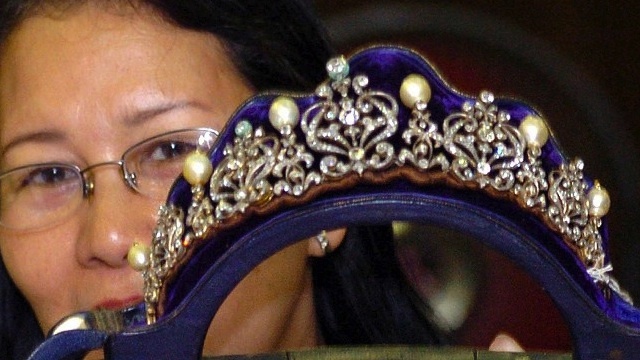 MANILA, Philippines (UPDATED) – The Sandiganbayan on Monday, January 13, forfeited in favor of the Philippine government the third jewelry collection of former First Lady Imelda Marcos that was seized from her in 1986. 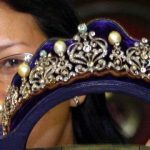 In a 33-page ruling penned by Associate Justice Efren de la Cruz, the court’s special first division forfeited what is known as the “Malacañang Jewelry Collection,” the last of Mrs Marcos’ 3 sets of collection covered by a court case and which have sat in a bank vault for decades. Two of these – known as Roumeliotes and Hawaii Collections – had already been forfeited in favor of the government. A 1991 valuation submitted to the court placed the value of the “Malacañang Jewelry Collection,” composed of sets of gems, between US$110,055 and $153,089. It’s considered the smallest of the 3 sets, composed of smaller and less expensive pieces that the family left behind when they the country at the height of the February 1986 EDSA People Power Revolution. In its ruling, the anti-graft court said this collection is also part of the ill-gotten wealth of the late deposed President Ferdinand Marcos and his family. “…(P)artial summary judgment is hereby rendered declaring the pieces of jewelry, known as the Malacañang Collection, as ill-gotten, and are hereby forfeited in favor of petitioner Republic of the Philippines,” the Sandiganbayan declared. Associate Justices Teresita Diaz-Baldos and Alex Quiroz concurred with the ruling. The Presidential Commission on Good Government (PCGG), represented by the Office of the Solicitor General, filed the petition on Dec 17, 1991. The Marcos family tried to block the PCGG move claiming the jewels were not covered by Civil Case No. 0141 which was filed in 1987. In its ruling however, the Sandiganbayan affirmed PCGG’s position that the collection was part of the government claim in Civil Case No. 0141 along with the 5 Marcos Swiss foundations – Aguamina, Avertina, Palmy, Vibur and Maler – the Arelma foundation maintained in Singapore. Mrs Marcos’ jewelry, worth at least $8 million, have sat in a bank vault for decades after being seized as part of assets allegedly plundered by the Marcos family before it fled to US exile in 1986, after 20 years in power. The government plans to ultimately auction them off. Mrs Marcos’ Roumeliotes Collection is composed of 60 pieces of more extravagant jewelry and loose gemstones seized from Greek national Demetriou Roumeliotes on March 1, 1986 at the Manila International Airport as he was about to fly abroad, according to the PCGG. The Hawaii collection consists of trinkets and baubles found inserted among the Marcos family’s luggage when they landed at the Honolulu International Airport on February 25, 1986, the PCGG said. Now a representative of Ilocos Norte, Imelda Marcos is the widow of Philippine leader Ferdinand Marcos, who ruled the country from 1965 to 1986, including 9 years under martial law. She enjoyed great influence as cabinet member and roving ambassador, but became the symbol of excess while the rest of the country plunged into poverty. She enjoyed a jet-setting lifestyle and amassed a huge collection of jewelry, fine art, and real estate — allegedly bought with money stolen from state coffers. But a popular revolt in February 1986 ended Marcos’ rule and sent him and his family into exile in Hawaii where the patriarch died 3 years later.